I was crestfallen when I got this transcription disc in the mail. The seller had packed it as if it were modern lp record and, of course, the package got bent in shipping and broke in two. She was kind of enough to refund my money, but I was disappointed that this little piece of 1939-40 World’s Fair History is toast now. I used the broken disc as an opportunity to work on my skills with these types of damaged records. So, I pieced it back together and transferred it with a stylus I was ready to retire, riding the tracking force as I played it. I managed to get a pretty decent sounding transfer, piecing together sections on the computer. It’s pretty listenable with only one skip. So, here’s “Invitation to the Fair”, a special 15 minute syndicated promotion program designed to get some more foot traffic to the Fair for the 1940 season. 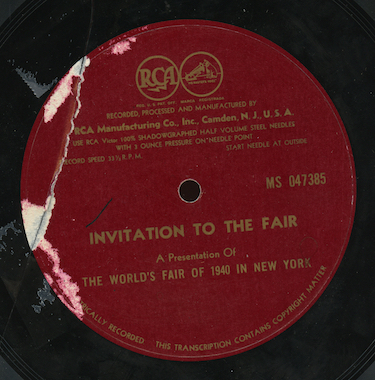 We hear an audio tour of highlights of the Fair and a message from the Chairman of the Board, Harney Gibson, along with music from the World’s Fair Glee Club, made up of staff from the event. I think this already exists out there, but here’s my copy. It was transferred from an original 16” one-sided transcription pressed by RCA, matrix number MS 047385. Golden lists one other 1939-40 World’s Fair promotion program for “The American Jubilee”. He lists it as program 4. Has anyone seen any other syndicated discs like this? I would love to find any that are still around.